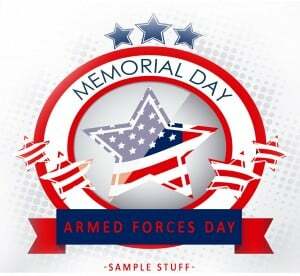 Memorial Day FREE Meals And More For Vets & Active Duty Military! You are here: Home / Savings Tips / Memorial Day FREE Meals And More For Vets & Active Duty Military! Monday is Memorial Day 2016, and many stores and companies want to acknowledge America’s veterans and active duty members of the military. In recognition of the service given by past and present members of the military, several restaurants are offering Memorial Day FREE meals when your provide proof of military service. Many of these freebies and deals will be going on throughout Memorial Day weekend. Check out this list of deals and freebies members of the military (and their families!) can take advantage of this weekend. Hooters restaurants are offering veterans and active members of the military a FREE meal with their beverage purchase. Bring proof of your military service to get your meal. McCormick & Schmick’s is offering a FREE lunch or dinner entree off a special menu to veterans as well as active duty members of the military on Memorial Day. Proof of military service is required to get your FREE meal. Members of the military along with their families can get FREE admission to Colonial Williamsburg from 5/27 through 5/30. Stores such as Home Depot and Lowes as offering a 10% military miscount on Memorial Day Weekend. This discount offer is available to veterans and active duty members of the military. To get your discount, present valid proof of service (such as a Form DD214). Get FREE admission to Knott’s Berry Farm, Kings Dominion, or King’s Island if you are a veteran or active duty member of the military over Memorial Day weekend. Family members of vets and military members can get discounted admission tickets. JCPenney is offering a 5% discount to members of the military, veterans, and their families from May 25 through May 30.